Final inspection in readymade garments industry has done after completing all the required process of garments manufacturing. Here, inspection can be done by the buyer’s Q.C (Quality controller). The quality of garments is insured here whether it is perfect for shipping or not. Mainly total inspection of a garment is done during final inspection because there is no facility to do total inspection before this. This is most important to the buyer’s point of view. 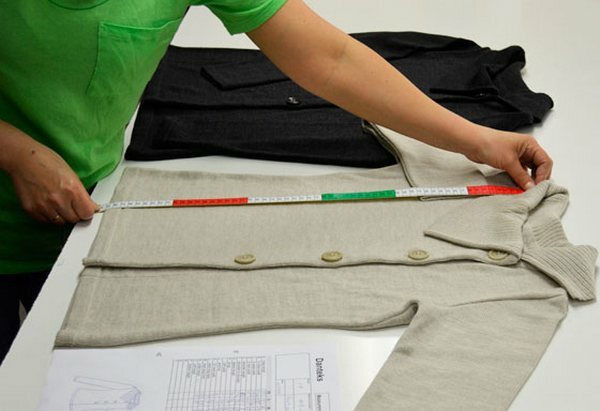 Mainly size, form fitting and other defects of a garment are inspected in the final inspection. The size i.e. size of apparel given to the label of garment is most important. If the garment is not made with the proper size followed by the garments specification sheet then the garment will be useless or rejected to the buyer. There is a standard body measurement for both gents and ladies. When the garments are made against this measurement, there is needed to make tolerance of that apparel. It is inspected for making of garments according to the acceptable tolerance chart. The following table shows the measurements and tolerance of full sleeve shirt of gents. To understand and point out the measurements, there is given a figure of shirt. A- 1/2 Chest, B- HIP, D- Collar, E- Sleeve length, F- 1/2 Arm hole, G- Shoulder, H- Shirt length, I- Cuff. Mention the process of final inspection in apparel industry. What are the inspection services in the garment industry? Describe the method of final inspection in garments industry. Mention various stage and processes of garments quality inspection in apparel industry. Describe the process of shirt inspection in garment industry.